A first-of-its-kind, all-in-one multimedia collaboration appliance for the personal office meeting space, Mitel UC360 combines in-room presentation display and multi-party audio and visual collaboration for remote participants. A unique solution, it addresses a growing market for easier, more spontaneous and cost-effective collaboration capabilities. Imagine being able to engage in rich, productive, multimedia collaboration with co-workers, partners, customers, and others as easily as making a phone call. With Mitel UC360™ Collaboration Point, you can do just that. 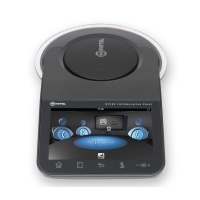 Created in response to customer requests for an easier, more cost-effective way to foster collaboration, it is a single device that combines in-room presentation display and multi-party audio and visual collaboration for remote participants. Compact, easy to deploy, touchscreen, simple to use, UC360 gives customers what they’ve told us they need to turn collaboration from a special event into a natural part of every work day.